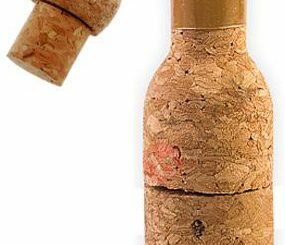 Before I throw away a wine cork, I always think that it could be utilized in some other manner – but without any crafty notions, I then end up chucking it. 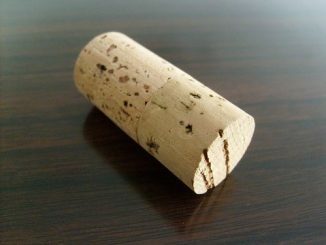 Every cork seems to have its own personality and history, which is why parting with them brings such sweet sorrow. 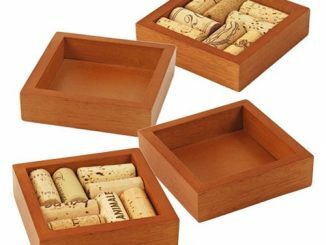 But with the Wine Cork Tray Kit, you could have a place to stash your corks and also a fancy tray to serve wine on. Pop those wine corks and create your own wine cork serving tray. 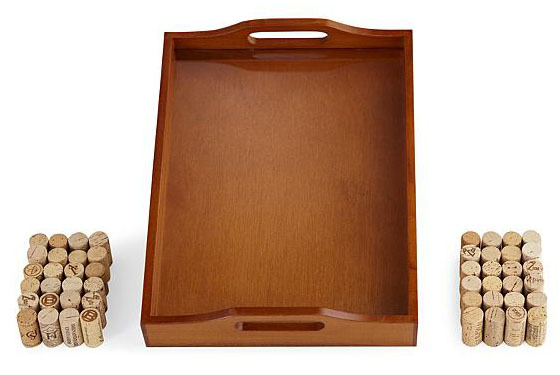 Our mahogany serving tray kit is an ode to your love of wine. 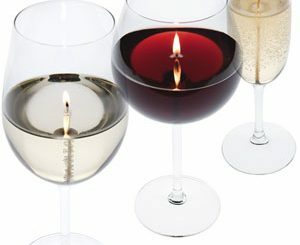 Simply arrange your collected wine corks on the tray and slide the clear Plexiglas cover over them. The corks will stay in place without a messy gluing process. 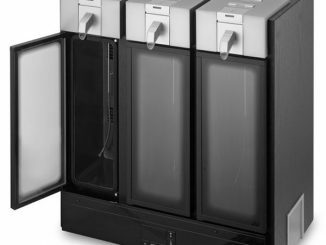 We supply the hardwood tray, Plexiglas and instructions. You supply the corks. 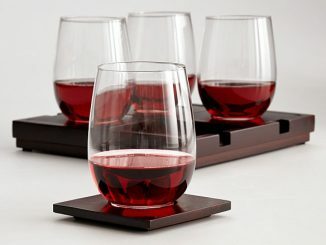 Endorsed by the Wine Enthusiast, it’s the perfect wine lover’s serving tray – where half the fun is in the making. set of 50 wine corks available as an add-on option for $14.95. Corks are used and will be assorted. 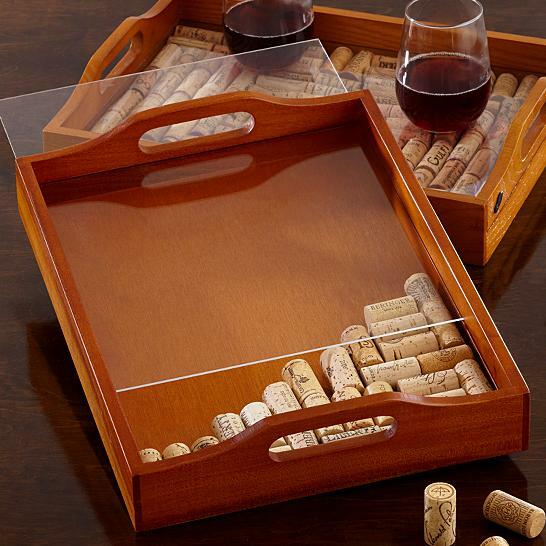 Ideally, you would have built up a collection of corks before procuring this tray. 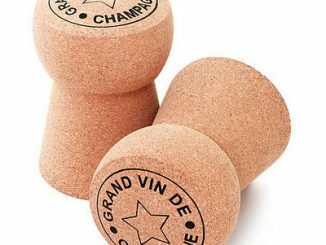 However, if you’re starting from scratch and are itching to fill the tray up quickly, you could purchase a set of 50 corks to help supplement. 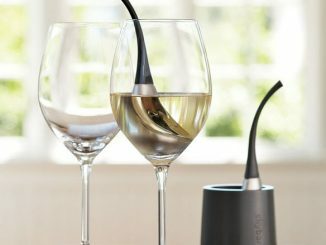 Or better yet, you could throw a huge wine party. It probably wouldn’t take long to accumulate 108 corks to fill the thing up. 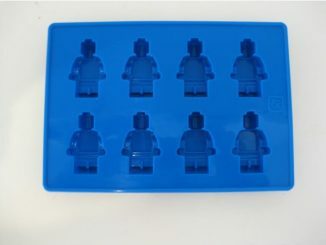 Once the tray is packed to the max, slide the Plexiglas over the corks and it’s ready to use. 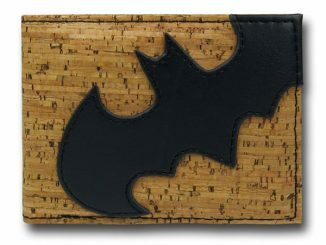 Wine buffs can purchase the Wine Cork Tray for $29.99 at Red Envelope. The set of 50 corks is also available for $14.95. 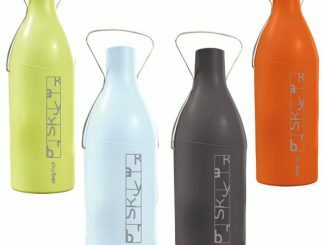 There are other original inventions using cork as well, such as the Corkcicle Wine Chiller, Cork Flash Drive, and ToastIt Drink Coasters.